Next month, Virgin Mobile USA will offer a new, prepaid smartphone plan that is really dozens of different potential plans rolled into one. It can be an emergency plan with just the bare minimum of minutes necessary to keep your phone number active. Or it could be a data-centric plan loaded up with gigabytes. It could become a social messaging plan, allowing unlimited tweets(s twtr) and Facebook(s fb) posts, or it could turn your phone into a connected digital music player with no restrictions on audio streaming. Virgin, which is owned by Sprint(s s), is calling the program Virgin Mobile Custom, and it will be available starting August 9 exclusively at Walmart(s wmt). The plan is limited to just three sub-$130 Android phones at launch: the ZTE Emblem and the LG Pulse and Unify. But Virgin aims to extend to other devices in the future, Sprint prepaid group President Dow Draper told me in an interview. The high degree of customization comes from ItsOn, a company that specializes in next-generation carrier billing and policy. Some of you may already be familiar with ItsOn from its now defunct virtual operator Zact, which used the same customization tools in its plans. Zact was always intended as a showcase for ItsOn’s technology, and in that sense it accomplished its mission. Sprint recently signed a multi-year deal to license ItsOn’s service. 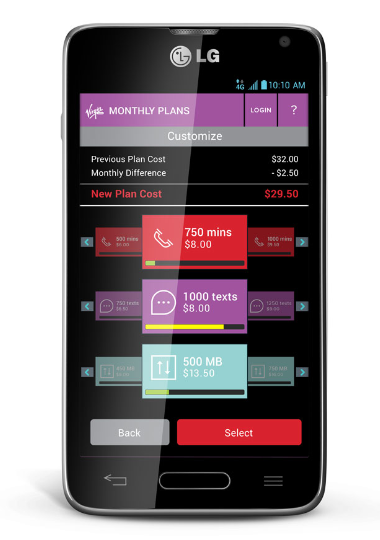 At the heart of Virgin Mobile Custom is an Android app, which can be used to set up a plan and tweak it at any time. According to Draper, a customer could select 1000 text messages initially, but in mid-billing cycle downgrade it to 500 messages. The customer would then be refunded for the difference, he said. Voice minutes, messages and megabyte buckets can all be selected separately and they can be applied to individual phones or shared across five lines in a family plan. 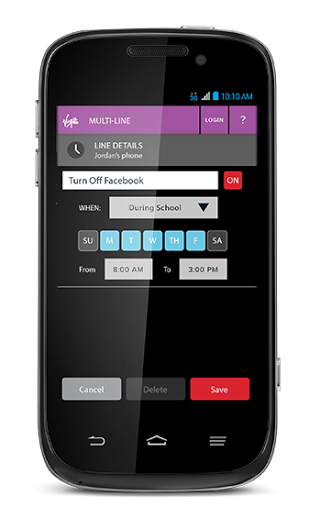 The app also comes with parental controls that can be used to finely tune the amount of talking, texting and surfing allowed on each phone. The most interesting elements of Custom in my mind, however, are the app-specific add-ons. To tack on unlimited social networking – meaning apps like Facebook and Twitter wouldn’t count against you data plan – cost $15 a month. If you only Twitter regularly, you could buy a Twitter-specific add-on for $5 a month. Draper said other add-on choices include an unlimited music streaming option and an unlimited navigation option. We’ve already seen T-Mobile go this route with its Music Freedom program, but these kind of toll-free zero-rated app plans are starting to pop up around the world. They’re an intriguing — though controversial — way for carriers to sell data in units more meaningful to the average consumer than the gigabyte. Virgin will release more pricing details on the plan when the program launches next month. How does one know the price before purchasing / with all these options ? Virgin/Sprint haven’t announced all of the details yet, but on August 9 there should be more price info on its site. Glad to see the app-centric model taking hold after so many years. In fact, this is much aligned with what FreeBand is doing with “toll-free apps” (we pioneered the IP back in 2010). I encourage your readers to check out the FreeBand technology (there is a Twitter stream @TollFreeApps) as it is both carrier and consumer friendly. Specifically, “FreeBytes” democratizes bandwidth as it motivates app providers to compete for the patronage of end-users by buying the bandwidth on their behalf and embedding the subsidized bandwidth into the apps themselves — proper toll-free as opposed to traditional zero rating. Ting.com have been running this very service for several years now. They allow use of a current Sprint handset, and allow voice roaming on Verizon towers, something no other Sprint MVNO does. bye bye net neutrality, and too an even higher degree any chance of a future for unlimited data that is not app specific. this truly and unbelievably stinks. i actually really liked this when is started reading the post thinking it would help people not overpay.but the paying for app categories is horrible. Hi Frank, thanks for commenting. I agree there are some net neutrality implications to this. After all, Sprint decides what counts as social networking and what counts as audio streaming and they generally favor the well-know internet companies. That said, you can still customize the plans without using an app category if you’re interested in this kind of plan. We’re still waiting to see the details on how granular the different tiers are, but if you wanted to customize a data plan for social networking by adjusting your data plan, I assume it’s entirely possible. For what it is worth, no matter what your position on “Net Neutrality”, if the use of app centric billing models culminates in users having subsidized / toll-free app access (by their choice — no one is forced to use a toll-free app if they don’t want), then I think this is a great trend for the customer. And note, a toll-free app is not intended to prioritize traffic (speed up / slow someone down) – its just a freebie on your data bill. the problem i see is that if sprint is successful at getting people to pay for ‘app categorizes’ or specific apps is that with time that will become the only option or at least that the option for unlimited and/or large buckets of unrestricted data will start to fade away. if a device was offered with a zero monthly charge and access to ‘toll free’ services i may see it differently. but so far i have not seen an indication of that sort of offering. Yeah, I see your point. It could encourage to sell data the way cable companies sell channels when all you really want are the individual shows. I think this is Sprint’s answer to what will eventually replace the unlimited plan, and as long a consumers demand that they get services in unlimited quantities this is what we’re stuck with.